Currently I have three tubes of this on the go- one on my desk at work, one in my handbag, and the third at home, and a back up tube. I can’t get enough of this- it’s pink, it’s massive, and it smells lush- what more is there to love?? Let me tell you. Those lovely people at Soap and Glory say that you should use Hand Food as "often as you want to soften, smooth and soothe dry, chapped or otherwise hampered hands and relish in the delightful aromas of fresh bergamot, strawberries and mandarin, with floral and fruity midnotes, and musk, amber and warm vanilla". 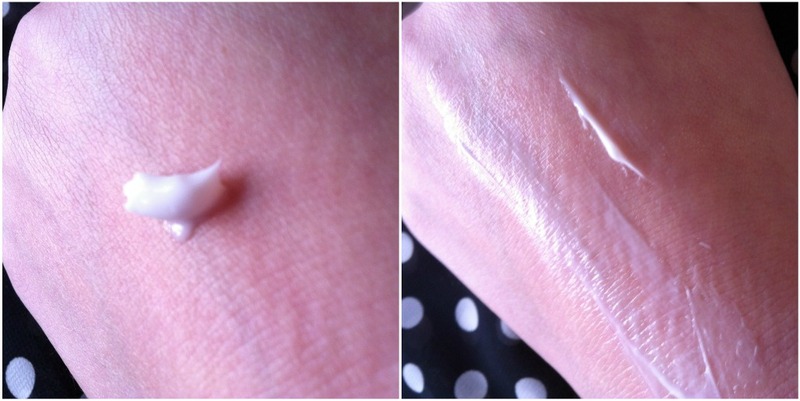 As you can see the cream itself looks quite thick in the tube, however once on the skin it literally absorbs straight in. A teeny amount goes a very long way, making this product very good value for money. The amount which I have on the back of my hand is more than enough for both (yes both) hands. Personally due to the little amount I use I would say that my hands don't feel greasy or clammy after applying it, just moisturised. I actually think I may have an obsession with it. It currently retails for £4.85 in Boots for the large tube which is in the pictures about, however they do a travel size for around the £2.25 mark. Normally the travelled sized tubes are on 3 for 2 throughout the year in Boots, however I would definately stock up when the full sized products are on offer. You can also purchase Soap and Glory from their website. my friend LOVES this stuff! I always get her one for xmas & birthday! !